Nuova versione di questo vecchio bootleg di Springsteen datato 4 dicembre 1980. Non trovo la sua copertina, qualcuno potrebbe mandarmela per e-mail? Transferred, edited and uped by Where’s Jeff? 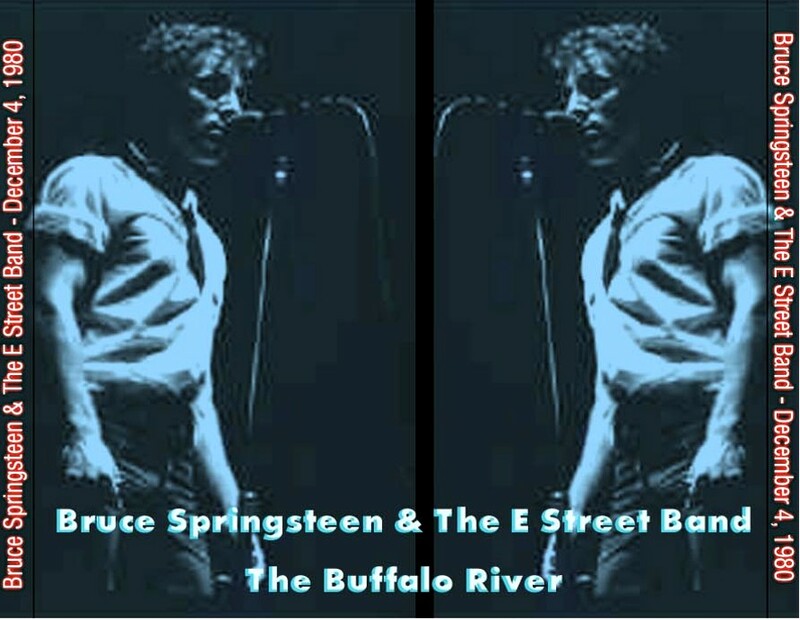 December twelfth will always be a remarkable day to me because it’s the anniversary of Bruce Springsteen’s River concert in Buffalo NY. It was the first time I saw Bruce and to this date it was the best concert I ever saw. It had a Beatlesque quality to it. It was everything a concert should be; you pushed aside all your troubles and just have a great time. Bruce more than delivered a great time this night ñ it was an unforgettable experience! First I’d like to state a little bit about me and my connection to recording of this show. In the late 1970’s and early 1980’s I was part of a small taping community in Buffalo NY. Like many teenagers, I was going to be a rock star, so I began playing the guitar; one day while jamming with another guitarist from school I noticed a tape player he owned. It was a slim line recorder, I can’t remember the brand name. When I saw it, the first thing I thought was that it would be so easy to seek that recorder into a concert and record it. I asked my buddy if he’d allow it and I was off. I recorded a small number of shows and got involved in the taping community, which was quite small at that time. One taper I knew, who had much better equipment than me, and recorded shows more regularly, was Jeff (I can’t remember his last name). Jeff recorded REO, Bruce and others during the 1980’s. When Bruce came to town Jeff was excited (as many other people were) and he decided it was time to buy some new equipment. 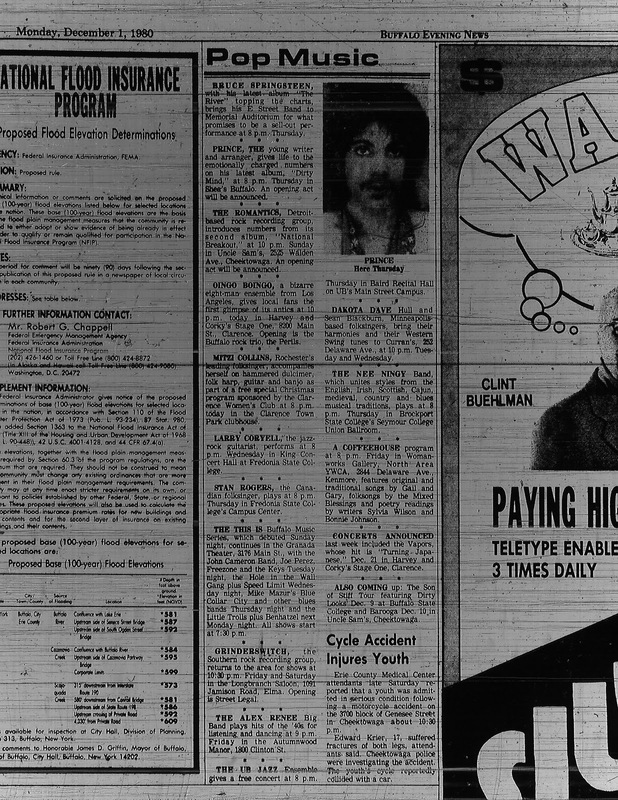 I can’t remember the specifics of the equipment, but I do remember he bought it at a store called ìStereo Advantageî, which was the premiere store for stereo equipment in the Buffalo area at that time. He also had an external microphone he used for this gig; again I don’t remember the specifics. Everything was high end for the times, I remember being amazed at the money he spent on the equipment. Now Jeff had one of the most creative ways to get a recorder past security that I have ever heard of. To get the recorder into the gig Jeff would put the recorder in a small potato chip bag, a bag about the width of your hand that you could easily hold in your hand by grasping the bottom of the bag. Of coarse Jeff was actually grasping the recorder not just a chip bag. So Jeff would walk up to the entrance to the auditorium with a bag of chips in his hand, appearing to be innocently chewing on his chips. When he got to the security guard for the pat down, he raised his hands over his head while the guard patted his sides. So the recorder was safe from discovery from security and Jeff walked right in with the recorder and a stomach full of potato chips!! This strategy worked for Jeff every time. Jeff did have some problems when recording. These problems can be heard during the first song ìBorn to Runî, for some reason the recorder kept pausing or losing power for short durations, so his recording is incomplete. I however recorded the show also (this recording is long gone) and Jeff took my recording of the show and his and he edited the two with his tape decks; the results were very good and you can hear it on the first song of the show, ìBorn to Runî. Another problem is the extreme high end that the equipment yielded. His other recordings didn’t sound like this, maybe it was because it was the first time he used the equipment and he didn’t have the settings quite right. I don’t remember exactly where he sat but it was in the stands and stage right. Some have rated this show as fair to poor sound quality. I think that is a bit of a harsh rating, I am biased but I find the recording listenable. Admittedly the slower songs sound better and some of the uptempoed songs are very hard to endure, but my tweaks have helped to make it enjoyable. You judge. This recording has given me hours of enjoyment since 1980 and I listen to the show every December 4th!! Now it has been 30 years since the performance and I am presenting this great recording in honor of both Jeff and Bruce. Enjoy!! Here’s a track by track listing with my comments to help you enjoy the show even more. Jeff’s recording begins the show and my recording begins with the line ìsuicide machinesî. I had trouble getting the tape started and I didn’t begin recording untill the line ìsuicide machinesî, so my recording of Born to Run was incomplete also; it’s my recording that continues till the end of the song and is the source for the majority of the song. I never heard the full version of Jeff’s recording of the song, but he said mine was more complete so what you have is the best known recording to my knowledge. A footnote: you can hear my cousin’s voice during this song; he says ìHURRY UPî because I was taking to long getting the recording going. Great memories!!! Always amazing, the crowd is great during this one. My cousin and I could not believe he was doing this song, it was one of our favorite Bruce songs. He would continue to surprise us all night! My favorite song of the night, this is simply the best performance I have ever heard of this amazing song. From the very first notes it’s just spectacular, his talk in the beginning of the song is so personal, you feel like he is talking straight to you! This one was requested by a fan who came to the show from Rochester NY. He met up with Bruce before the show and asked him to play the song at that time. Cries of BRRRRUUUUUCCCE are heard often during the show, and before before this song begins you can hear someone explain to another that they are saying Bruce and the assumption is the person thought they were booing. Funny! Words can not describe how awesome this song was live, just listen and enjoy!! This was performed at the peak of the songs popularity. It was amazing!! During this song Bruce and Clarence had a stare down battle in which they continuously looked into each others eyes as they walked back and forth across the entire width of the stage. They both had their instruments in their hands as they did this. There was no obvious reason why that they did this, but it was fun to watch, they simply walked back and forth across the stage and never took their eyes off each other. They did this after Clarence sings ìBut Your Heart stays Coolî in his deepest baritone voice. At this point in the song the music completely stops and Bruce and the Big Man do their thing. It was great to watch but it’s not much to listen to, therefore Jeff edited this part out of the audio recording. Bruce did this by request for a guy who planned on proposing to his girlfriend during the song. As I remember the guy held up a sign requesting the song, I’m not sure how Bruce knew the guy was planning to propose during this song. Bruce and the band play some romantic music before the song officially begins to set the mood for the couple, Bruce at one point during the musical introduction asks ìHave you asked her yet? I can’t keep this going foreverî. I can only assume that he proposed and she said “YES”, it would be a great finish to the story if they were still together today! Tony, you out there? How’s the marriage? A real oldie – even in 1980! Powerful is all I can say for this performance. 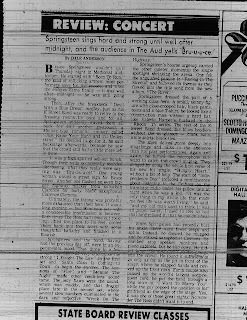 According to this web site: http://www.springsteenlyrics.com/lyrics/s/santaclausiscomintotown.php Buffalo was the first city that he played this song in 1980. This song was played with the house lights up. I think Bruce was suppose to be done but he came out with the house lights up and performed!!! The master tapes were recorded onto an unknown tape brand, but Jeff was a pro and I am sure he used high grade tapes. My cassette copy is straight from Jeff’s master tapes; my recording is on TDK AD-C 60 & 90 tapes. Playback was on a JVC TD-W20 cassette deck. No dolby was used. The recording was captured as a wave file 44.100 khz and 16 bit stereo using Total Recorder. I EQ’d the wave file to give it some needed bass boost and reduce the ultra high end treble that is in the original recording. I used Nero wave editor for the equalization. A little volume boost was added after the Eqing. No other alterations were made to the original audio. The files are in folders for easy CD burning and have an 01 or 02 before the file name to designate the set number. I threw some extras from the same time period as the show ñ they fit nicely on Disk 3 – Enjoy! I think what I have presented Here will be a great experience in the re-living of this wonderful show, and may you appreciate this recording as much as I have these 30 years!!! 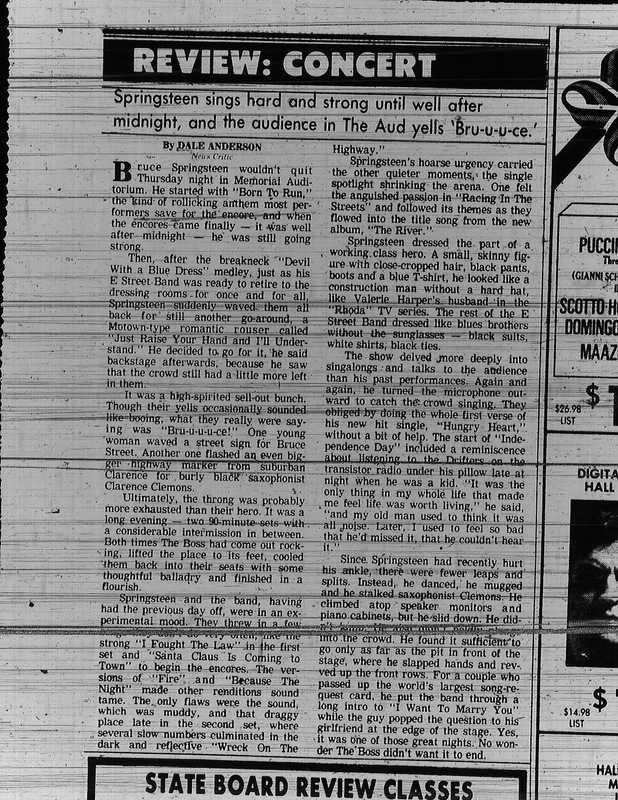 This entry was posted in 1980, audio, bootleg, springsteen, the river and tagged 1980, bootleg, springsteen, the river by Tsitalia. Bookmark the permalink. 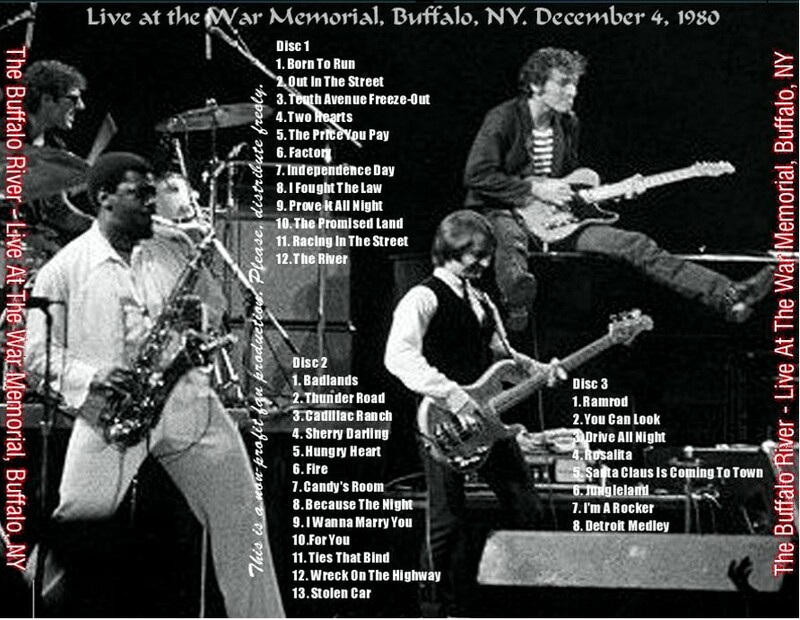 This was a hot concert on Thursday, December 4, 1980 at the War Memorial in Buffalo, New York. The setlist consisted of 34 songs with 5 encores. At this moment, I’m looking at the Rolling Stone magazine cover with Bruce speedskating on a frozen late somewhere near Buffalo; the article written by Fred Schruers includes the scene of Bruce ordering lunch from the McDonald’s in the city during the afternoon and his comments from the stage at night in the War Memorial. This incredible concert was a month after St. Raygun was elected president and four days before John Lennon was murdered. It must have appeared to sane and rational Americans that their country was losing its mind, but they didn’t foresee the current period of time that would occur 36 years in the future. Let’s hope that the gun-toting losers/lunatics of this land stay away from Bruce during his current book tour; it is always so sad when history repeats itself in the most pathetic way here in the USA.